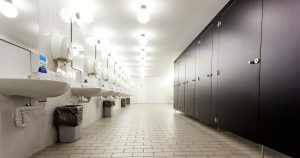 Why You Should Invest in a Restroom Cleaning Service | Ace Uniform Services, Inc.
A commercial restroom cleaning service is a excellent investment for commercial business owners! You should invest in a professional restroom cleaning service because your employees, business associates, and clients will thank you for it. Having a professional service maintain your restroom means that it will always be in top condition. You can concentrate your efforts on running your business while you let the professionals handle the restroom responsibilities. All kinds of bacteria thrive in bathrooms that aren’t properly maintained. Types included are e.coli, streptococcus, paratuberculosis, salmonella, and staphylococcus. These forms of bacteria require a combination of strong and effective tools and cleaning techniques. Professionals not only have the tools, but the training to help maintain a safe and clean restroom. The Bradley Corporation conducted a survey that revealed that many consumers are fearful of exposure to germs in the restroom with 64 percent indicating that they operate the toilet flusher with their foot. You can help minimize some of those fears by maintaining a sterile and hygienic environment. Restroom cleaning services have tools and equipment that will help ensure that your restroom smells clean and fresh throughout the day. They use odor neutralizers that destroy odors rather than just masking them. While some are fan-operated systems, others work with motion sensors or by using a timer. A professional service will develop a strategy that will be effective in covering the size of your restroom, for both large and smaller company restrooms. This entry was posted on Friday, March 16th, 2018	at 12:24 pm	. You can follow any responses to this entry through the RSS 2.0	feed. Both comments and pings are currently closed.